Youtube made another Filipino talented to become famous internationally. Like Charice, Zendee Rose, and now a Filipino boy who sang "Dance With My Father," who originally performed by Luther Vandross, invited by American TV host Ellen DeGeneres. Ellen DeGeneres said, "Last week, I saw this video of a young singer. 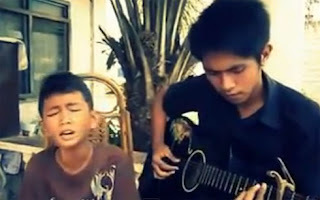 He's from the Philippines and you got to see this kid, amazing." She added, "How beautiful is that. That soul in the little boy. I'm looking for you. Please come here and sing to me and all of my friends here. You are amazing." Aldrich Lloyd Talonding invited to perform in the "The Ellen DeGeneres Show." If you did not yet watched the video of Aldrich Lloyd Talonding, just refer to the video below. For the meantime, If you like this information, please bookmark it now or visit this site more often for you to be updated. You may also share this post to your friends so they may know about Aldrich Lloyd Talonding wows Ellen DeGeneres. Comments or suggestions about "Aldrich Lloyd Talonding wows Ellen DeGeneres" is important to us, you may share it by using the comment box below.